Here at Broadgate we’re looking ahead to a fresh start in 2019 with a vibrant calendar based around a programme of wellbeing, mindfulness and creativity. 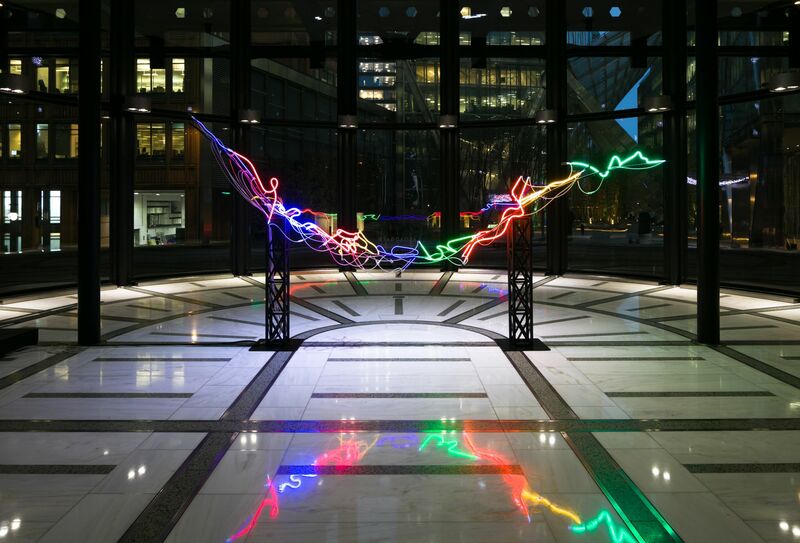 As studies continue to suggest that engaging with art can be beneficial to your mental and physical health, freshen up your plans for the new year with a closer look at Senses of Light, our exhibition of energising artworks by Kevin Killen located throughout the Broadgate neighbourhood. I first came across Kevin Killen’s artwork through Sculpture in the City during June 2017 and was captivated by its glowing appearance. We chatted on the phone over the coming months, meeting at Broadgate during summer 2018. Immediately Kevin was drawn to the sights and sounds of people going about their every-day lives and knew instinctively that he wanted to capture this aspect of our environment. Kevin returned to his studio and, over the next few weeks, we talked more about how this could be achieved. It was decided that he would undertake night-time photography and an audio recording session of nearby Bishopsgate and beyond. A few weeks later, Kevin returned to Broadgate one evening, just as the day was beginning to fade, armed with his camera and various other pieces of equipment. The ensuing drawings, which are located in the lobby of 201 Bishopsgate and on L1 of the Broadgate Tower, are the direct result of this particular session. Dramatic and bold on their dark grey and black backgrounds, some areas within each piece suggest flashes of headlamps, whilst others appear fluid and meandering. Take a look at these artworks and imagine half-closing your eyes whilst looking up and down Bishopsgate; you can literally sense the light, the colour and the energy of the surrounding pedestrians and vehicles. Also, whilst these drawings reflect a moment in time, a snapshot of a given moment, the patterns which echo within each drawing are reminiscent of repeated activities, almost like a graph or chart of the daily routine undertaken by us all. The next phase at Killen’s studio was to realise a series of glass 3D models. Carefully picking out individual ribbons of brightness within the drawings, Kevin began to construct tubes of coloured glasswork which he knitted together to form sculptural models. Complex and physically demanding, these pieces echo the shapes and forms of his drawings, but hint at a different interpretation and, whilst still in the development phase, it became clear that they formed the perfect starting point for a major glasswork. Killen determined that the iconic location of Exchange House would provide the perfect site for this new reflective neon and glass artwork. With this in mind, we spent some time considering how best to capture the form of nearby Bishopsgate. After several designs, Kevin settled on a linear motif, something he knew would echo the road’s trajectory, both in terms of its actual physical structure, and also through the repeating reflections that would dart across and along the surrounding glass and polished surfaces. Inspired by the architectural pillars within the atrium, we configured two vertical platforms from which Lux could be supported, allowing it to act as a welcoming beacon for visitors from the Broadgate neighbourhood, Shoreditch and beyond. When looking at this piece, take note of the pulsing neon; these relate directly to the audio recording taken by Killen during his night-time visit and reflect the exact rhythm captured by his equipment at this time. Share your best photography of Kevin Killen's arwork pieces by tagging us on Instagram or Twitter using @BroadgateLondon and #BroadgateLondon. Stay up to date with the latest art, news and events by subscribing to our newsletter here. 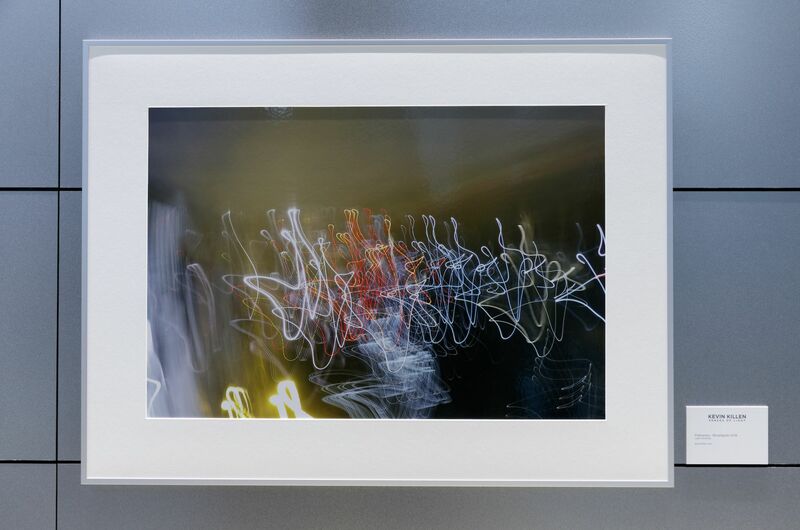 Senses of Light has been produced and curated by Broadgate’s Art Curator, Rosie Glenn. Viewings of the artwork are available 10am-4pm each weekday. 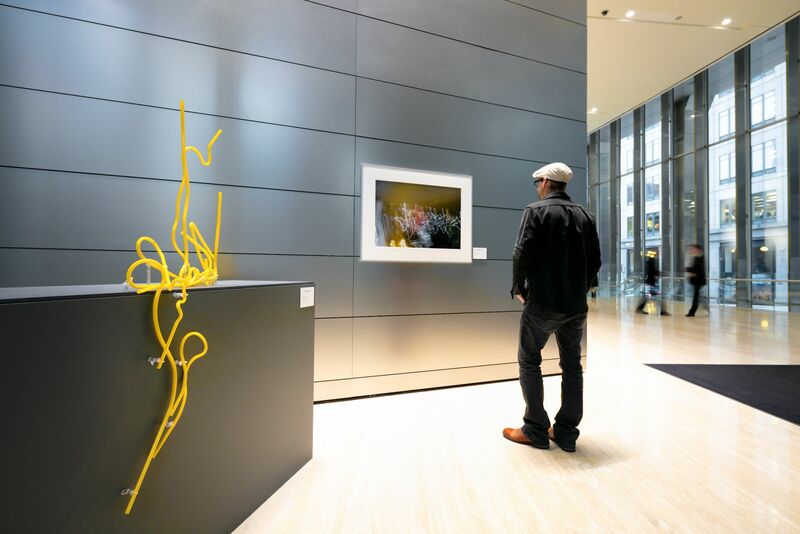 To ensure ease of access on arrival at Exchange House, 201 Bishopsgate and The Broadgate Tower, please confirm your visit by email to Broadgate's art curator Rosie Glenn: rg@rosieglennfineart.co.uk. Senses of Light photos by Brendan Bell and Luca Piffaretti.